Maritime Developments (MDL) has dispatched its new 4-track pipelay tensioner to Asia Pacific, after securing the first job for the system with a global offshore contractor. The portable 110-tonne unit – unveiled recently during a client Open Day at the company’s testing facility in Peterhead, Scotland – will be used for an umbilical installation in the Indian Ocean, to transition 28 kilometres of product from the beach to seabed, at 300 metres water depth. 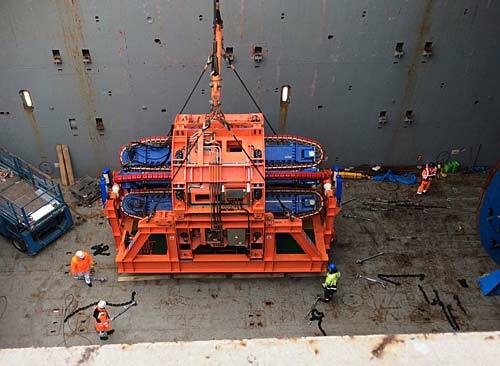 The tensioner will be operated by the company’s experienced crew as part of the MDL Offshore Service, providing flex-lay solutions for global projects, and the campaign is expected to conclude in early March. The caterpillar-track TTS-4/310 Series Tensioner retains the unique safety and operational features of MDL’s 4-track tensioner range, including failsafe grip system, self-centring track system and a modular, road-transportable design - making it an unparalleled solution for global operators and vessel owners looking to maximise their project opportunities while simultaneously reducing costs. Thanks to the portable design, the 110-tonne unit comes as a more versatile and compact system than the traditional market offering for the equivalent working loads – commonly requiring two smaller tensioners for like-for-like operations. The system is the biggest delivered by MDL to date, and will be the second TTS-4 system employed on operations in Asia Pacific, following a 50-tonne unit order to the region in 2014.